In addition to the intersection improvements shown in the previous pages, a number of other treatments can help to improve pedestrian safety. 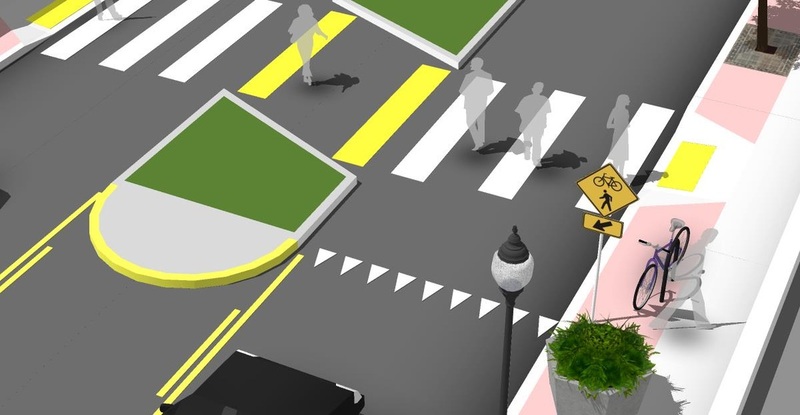 These pages illustrate pedestrian crossings at midblock locations or “uncontrolled crossings” where cross traffic would not otherwise be required to stop. A simple mid-block crossing may be sufficient for pedestrian safety at some locations, but stronger treatments, such as Rectangular Rapid Flashing Beacons (RRFBs) or pedestrian bridges or tunnels may be warranted at crossings with multiple travel lanes, high volumes of traffic or high-speed traffic. 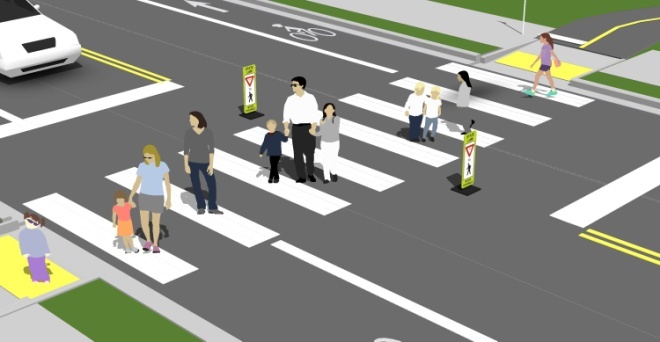 In-street pedestrian crossing signs reinforce the presence of crosswalks and remind motorists of their legal obligation to yield for pedestrians in marked or unmarked crosswalks. This signage is often placed at high-volume pedestrian crossings that are not signalized. On streets with multiple lanes in each direction, additional treatments such as median islands or active warning beacons may be more appropriate. Advance yield lines are similar to the advance stop lines described earlier, except they are used for crosswalks at mid-block crossings. Often called “shark teeth,” these advance yield lines are a row of white isosceles triangles at least four feet away from the crosswalk. Setting these markings further back on multi-lane roadways can reduce the possibility of yielding drivers in one lane obstructing the visibility of the crosswalk for drivers in other lanes. Rectangular Rapid Flash Beacons (RRFB) are user actuated illuminated devices designed to increase motor vehicle yielding compliance at crossings of multi-lane or high volume roadways. Paired with pedestrian crossing signs, they provide a high-visibility signal of pedestrians in the crosswalk. Hybrid beacons are traffic control signals commonly used to stop traffic along a major street to permit safe crossing by pedestrians or bicyclists. The signals provide very high levels of compliance by using a red signal indication, while offering lower delay to motorized traffic than a conventional signal. Underpasses provide critical non-motorized system links by joining areas separated by barriers such as railroads and highway corridors. In most cases, these structures are built in response to user demand for safe crossings where they previously did not exist. 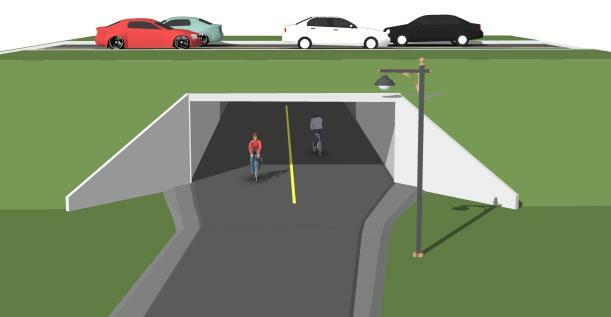 A Crime Prevention Through Environmental Design (CPTED) lens should be followed when designing the underpass. Overpasses provide critical non-motorized system links by joining areas separated by barriers such as deep ravines, waterways or major streets or freeways. A Crime Prevention Through Environmental Design (CPTED) lens should be followed when designing the overpass.